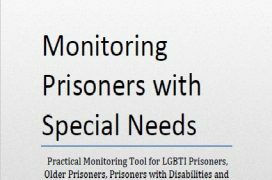 This practical tool has been designed for monitoring bodies, NPMs in particular, to take a close look at the treatment and detention conditions of prisoners with special needs. These include LBGTI prisoners, older prisoners, inmates with disabilities and foreign nationals. The tool lists relevant international standards and questions to ask or issues to look at while monitoring the treatment or conditions of these vulnerable groups in prisons and other detention facilities. 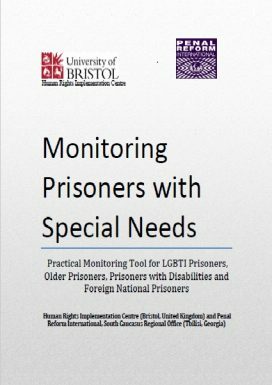 The Human Rights Implementation Centre (Bristol, UK) and the Penal Reform International, South Caucasus Regional Office (Tbilisi, Georgia) with the financial support of the ESRC Impact Acceleration Account of the University of Bristol, have developed the present set of monitoring tools to be used by the NPMs and other monitoring bodies during prison oversight.